Introduction: The aplasia or hypoplasia of the vestibulocochlear nerve is one of the causes of sensorineural and congenital hearing loss. Their diagnosis is important to candidates for cochlear implant, for being a contraindication for such procedure, by this matter they are suitable for the brainstem implant. Objetive: To present a case of sensorineural hearing loss with definite ethiologic diagnosis. Case Report: A 11-year-old female patient, Caucasian, whose family complained of her being disattention and dyslalia, by apparently presenting floating hearing. The audiometry presented lack of hearing in the left ear and moderate sensorineural hearing loss in high frequencies in the right ear. CT of the Temporal Bone showed aparent atresia or significant stenosis of the left cochlear foramen and normal right cochlear foramen. The MRI demonstrated that the left eighth cranial nerve had smaller caliber than the right one and cochlear division was not identified. Discussion: It is important to find etiology in children with sensorineural hearing loss, once procedures might differ when regarding malformation. Conclusion: The objective of this presentation comes to the fact of a rare diagnosis of sensorineural hearing loss, that somehow could be concluded as an idiopathic hearing loss and also it reassures the importance of CT and MRI exam for sensorineural hearing loss. The aplasia or hypoplasia of the vestibulocochlear nerve is the causes of sensorineural hearing loss and congenital deafness. Although aplasia or hypoplasia of the vestibulocochlear nerve is rare, their diagnoses have been considered important before surgery for candidates to cochlear implant. It is a contraindication to surgery combined with the narrowing of internal acoustic meatus (1), and for these cases, brainstem implant is the recommended approach. The recent advances on imaging exams enable to achieve detailed definition of the anatomical structures of the internal acoustic meatus when precisely contrasting nerve branches and the Cerebrospinal fluid (CSF) (2). An 11-year-old girl, Caucasian, whose family complained about her absence of mind and dyslalia (a speech defect caused by malformation of or imperfect distribution of nerves to the organs of articulation). Also, the child seems to suffer from hearing alteration. She has epilepsy seizures and makes use of Valproate (Valproic Acid). Auditory exam revealed some hearing in the left ear and sensorineural moderate dysacusia in high frequencies in the right ear (picture 1). CT of the temporal bones showed apparent atresia or expressive reduction on amplitude of the left cochlear foramen, and normal right cochlear foramen (picture 2).The vestibule and semicircular canal are in normal condition as well as the cochlear and vestibular aqueducts. At the Nuclear magnetic resonance (NMR) of the cranium, the caliber of the left eighth cranial nerve presents smaller than the right one and cochlear division is not identified (pictures 3 and 4). It is also noticed discreet hypoplasia of the left modiolus, but no identification of cochlear foramen; it is clearly seen the reduction of the transversed diameter of the cochlea with identification of cochlear scales of the second and third spirals. The right eighth nerve and right facial one presents routes and calibers in normal condition. Picture 1 - Audiometry exam. Picture 2 - CT of the temporal cones showing apparent atresia or expressive reduction of amplitude of the cochlear foramen to the left and normal cochlear foramen to the right. Picture 3 - MNR of the ears in Fiesta 3D pulse sequence of high resolution: left eighth cranial nerve presents smaller caliber than the right one and cochlear division is not identified. Picture 4 - MNR Fiesta 3D pulse sequence: sagital reconstruction. It is important to make an etiological diagnosis for children with sensorineural hearing loss because procedures can differ if it is a case of malformation. CT shows bone labyrinth, and MNR shows the anatomy of membranous labyrinth and also their anatomical relations, by focusing possible abnormalities of the three branches of the vestibulo-cochlear nerve. The aplasia of the vestibulocochlear nerve and aplasia or hypoplasia of its cochlear branch may occur isolated or combined with stenosis of the internal acoustic meatus and/or labyrinth malformation. The human cochlea portion starts developing with the arising of otic plaque in the third week of embryonary life. Otic plaque is transformed into otic vesicle originating the endolymphatic duct, the utricle, the sacule, the semicircular canals and the cochlea. In the ninth week the chochlea spirals are already formed and neural epithelium begins to appear. The neuroblasts of the cochlear ganglion disaggregate from the otic epithelium and the fibers of the cellular bodies of such ganglion grow from the outside into the otic epithelium and into the brainstem (3). 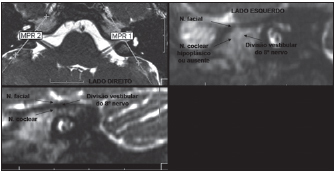 The aplasia or hypoplasia of the vestibulocochlear nerve has already been a matter of suspicious in cases of unsuccessful cochlear implant in which there was no response to electric stimulus and in children with a stressed narrowing of the internal acoustic meatus. Eight children were submitted to cochlear implantation presenting an acoustic meatus of 1-2mm diameter. Three of them did not present sound perception after surgery, and anatomical findings of the narrowing observed from the high-resolution CT would represent aplasia of the nerve (1). If the diameter of the internal acoustic meatus is less than 1.4mm, an abnormality of cochlear nerve should be considered, and if it is bigger than 3.0mm, there might be the existence of other abnormalities (4). Histopathological studies on temporal bones also suggest that a well-formed cochlea and an apparently normal Corti's organ might coexist in the absence of the spiral ganglion and the cochlear nerve, and even when the internal acoustic meatus has a normal caliber (5). The aplasia or hypoplasia of the vestibulocochlear nerve, as one of the etiologies of sensorineural and congenital hearing loss, can be diagnosed by MNR of of fine cuts (mm) of the internal acoustic meatus. Based on clinical finding, on MNR and on embryological issues, such entity can be classified into three types (2): Type 1: aplasia of the vestibulocochlear nerve associated to stenosis of the internal acoustic meatus; Type 2: stem of vestibulocochlear nerve with aplasia or hypolasia of the cochlear branch with (type 2A) or without (type 2B) labyrinth malformation; Type 3: stem of vestibulocochlear nerve with aplasia or hypolasia of the vestibular branches (hypothetic). The absence or reduction of caliber of the cochlear nerve can be established by MNR, which is important on diagnosing and on therapy strategies of sensorineural hearing loss, especially for congenital one and also on suggesting cochlear implant. 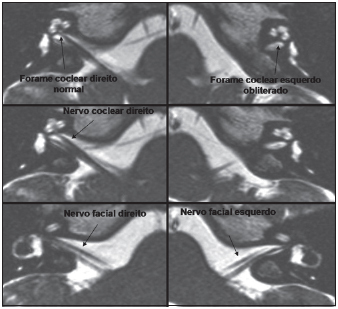 T2 MNR presents an excellent image of cisternal and intracanalicular segments of the facial nerve and of the vestibulocochlear nerve divisions: superior vestibular, inferior vestibular and cochlear one (6). The reported patient presents profound sensorineural deafness to the left and sensorineural loss in high frequencies to the right. The cause of the right side was not identified. 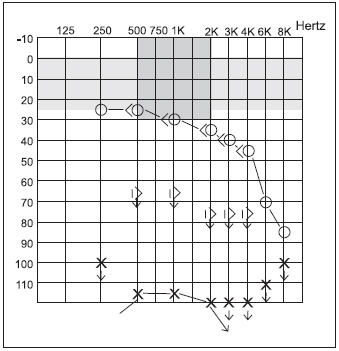 For presenting a social hearing in accordance with the parameters of normality in the right ear, the diagnosis was late in relation to little hearing to the left, and only one specific audiological exam could determine profound loss of hearing. Epidemiological studies suggest that one third of the causes of hearing loss is hereditary, another third is acquired and the remaining part is idiopathic (7). The report of the current clinical case is due to the fact of a diagnosis of a rare entity on sensorineural hearing loss, which could be considered as an idiopathic loss. It also highlights the importance of both CT and MNR for cases of sensorineural hearing loss. Cochlea implant was not recommended in this case, because patient presents a contralateral hearing that enables her to communicate. 1. Shelton C, Luxford WM, Tonokava LL, Lo WW, House WF. The narrrow internal auditory canal in children: a containdication to cochlear implants. Otolaryngol Head Neck Surg. 1989, Mar, 100(3):227-31. 2. Casselmann FE, Offeciers FE, Govaerts PJ, Kuhweide R, Geldof H, Somers T, D"Hont G. Aplasia and hypoplasia of the vestibulocochlear nerve. Diagnosis with MR imaging. Radiology. 1997, 204:773-781. 3. Hemond G, Delanty FJ. Formation of the cochlea in the chicken embryo: sequence of innervation and localization of basal lamina - associated molecules. Brain Res Dev Brain Res. 1991, 61:87-9. 4. Stjernholm C, Muren C. Dimensions of the cochlear nerve canal: a radioanatomic investigation. Acta otolaryngol. 2002, Jan, 122(1):43-8. 5. 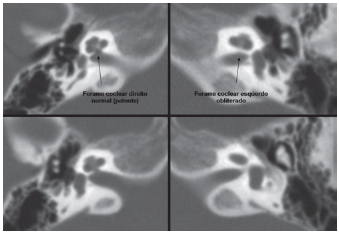 Nelson EG, Hinojosa R. Aplasia of the cochlear nerve: a temporal bone study. Otol Neurotol. 2001, Nov, 22(6):790-5. 6. Glastonbury CM, Davidson HC, Harnsberger HR, Butler J, Kertesz TR, Shelton C. Imaging finding of cochlear nerve deficiency. American Journal of Neuroradiology. 2002, Apr, 23:635-43. 7. Grundfast KM. Hearingo loss. In: Bluestone CD, Stool SE, Kenna MA e cols. Pediatric Otolaryngology 3rd edition. Philadelphia. WB Saunders Company; 1996, pp. 249-311. 1. PhD in Medicine by Universidade Federal de São Paulo (Federal University) - Escola Paulista de Medicina - UNIFESP (Associated Professor of the Department of Especialized Medicine (ENT Discipline) at Centro de Ciências da Saúde da Universidade Federal do Espírito Santo -UFES) - Health Science Center - Federal University. 2. Master degree in Otorhinolaryngology and PhD in Medicine by Universidade Federal de São Paulo - UNIFESP - Escola Paulista de Medicina (ENT Doctor in Vitória, ES - Brazil). 3. Physician by Universidade Federal do Espírito Santo (UFES) (Resident doctor of the Clinical Otorhinolaryngoly Discipline at Hospital das Clínicas da Faculdade de Medicina da Universidade de São Paulo - FMUSP). 4. Physician by Universidade Federal do Espírito Santo (UFES) (Radiologist at Multiscan, Vitória, ES). 5. Medicine Student (Monitor of Operative Techniques at Escola de Medicina da Santa Casa de Misericórdia de Vitória - ES, EMESCAM). This article was submitted to SGP (Sistema de Gestão de Publicações - Publication Management System) of R@IO on June 19th, 2007 and approved on November 8th, 2007 at 00:36:02.